This is the perfect place to enjoy all that Hollywood has to offer. Walking distance to Hollywood and Highland, Mann Chinese Theater, Hollywood Walk of Fame, The Cinerama Dome, Amoeba Music, tons of restaurants, bars and nightclubs - there is literally no chance you will ever be bored in this neighborhood. The apartment is gigantic - over 850 square feet. There is a ton of room for everything with two closets, shelves and drawers for all your stuff. There are lots of areas to relax and enjoy. First of all the private balcony gives you a birds eye view of the neighborhood and the lush garden below. There are two "bed rooms" with a closing door - as if you're entering a deluxe hotel suite with a separate second bedroom. They are both connected to the private outdoor patio - a great space to people watch or enjoy a morning cup of fresh coffee. The kitchen has a large breakfast nook and vintage stove. Pots, pans, silverware, a toaster, microwave, coffee pot, kettle, everything you need to prepare basic meals if you enjoy cooking - although there are numerous restaurants to suit every budget within walking distance and many of them deliver as well. It's clean, it's comfortable, it's safe, it's fun, and it's in a great location. I work in entertainment cutting commercials for television shows and movies. The neighborhood is the big draw. It's walking distance to so many great places and our corner is very friendly and the neighbors are great. The history of the property is interesting as well. I am only the third owner since 1915 when the main house was built. It was one of the first in the neighborhood. A Greek family bought it in the 70s and the father was the one who established the community garden across the street. Apparently he used to go across the street and gather ingredients while he was cooking. Neighbors come by and tell stories about him - I guess he was a bit of a character. When I was looking at it it just felt like the kind of place I'd want my son to grow up and invite my friends and family to come over and enjoy. The studio was great... just what I needed while I was visiting for work. The place could use a little touch ups here and there but otherwise it was perfect for me. The Terrace and the sun room with futon were perfect for having guests over. The owner was very nice as well. This was lovely, you could walk to any public transport, supermarket or to Hollywood blvd. It had everything we needed to make our stay comfortable and I loved sitting out on the balcony of an evening just watching the world go by. Not having to worry about keys also helped. This suited us and our requirements brilliantly. It does have stairs which we were fine with but would not be suitable if not mobile. Was also deceptively quiet. Myself, husband and two children had the misfortune of staying in Alex’s property for two nights (booked for five but had to leave due to cockroaches). The apartment is certainly not ‘vintage’ just old, tired, dirty, shabby and run down. The bed sheets are stained and don’t smell fresh; the windowsills are rotting with dirty cotton buds in the recess; bare wires hanging from the ceiling; the yard to the apartment resembled a bomb site with rubbish strewn about; smell of cannabis and noise from party from flat below. Arrived back late on our third night to find a number of large cockroaches in the kitchen so we phoned Alex who informed us he’d arrange for an exterminator to call the next day and basically implied what did we expect for the money!!!! This was the final straw and we informed him that we were leaving. He agreed to reimburse us for the three nights providing we didn’t “burn him with a bad review”. As we haven’t received any sort of refund or response we felt compelled that we should warn any potential renters of this property. Stay elsewhere !!!! This house was PERFECT for us! 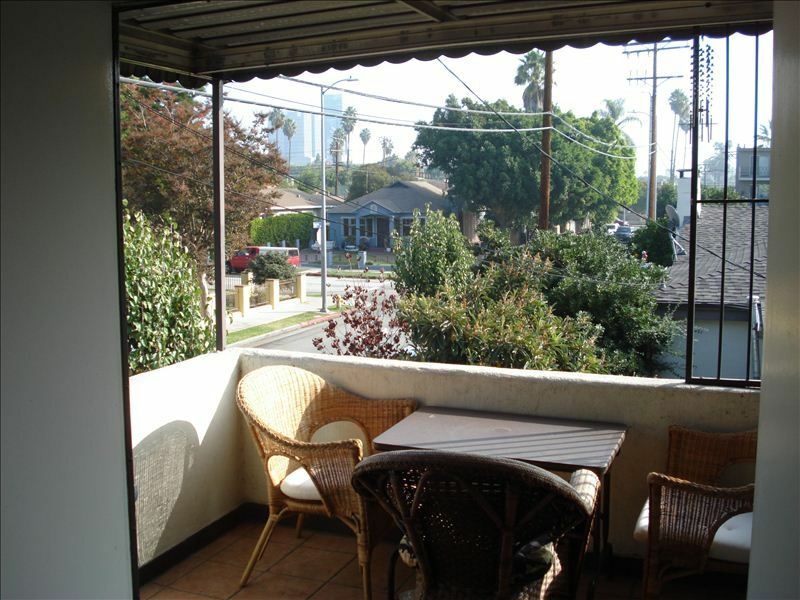 The home’s location is excellent for getting to Sunset, Hollywood, and Santa Monica BLVD within minutes walking. We spent several days walking around the area with ease. Coming from the East coast, the city itself looked a bit dated and rundown. It also had a lot of nice characteristics, buildings, etc. All of the people we interacted with while walking through the area were extremely pleasant. Never felt unsafe at all. I did notice that outside on the street there were cockroaches. Upon researching, I found cockroaches are a normal thing in big cities like California, particularly the Hollywood area. A few did enter the house, but I only spotted a handful during the two weeks we stayed. They stuck to the bathroom and kitchen areas and they are quite large so easy to spot. You can tell Alex is proactive in addressing the issue and he does great for this in general. There were NO bed bugs or spiders inside the house. We stayed at Alex’s house for TWO WEEKS in JULY 2018. I traveled to Los Angeles with my two small children (Both under 10) and my husband. We were visiting husband’s daughter (teenager) so the majority of the time we spent in the house was as a group of five. The house was quite spacious for all of us. The opening from the bathroom into the closet was also excellent for storing items that would be needed. The beds were comfortable for all of us and the air conditioner worked well for keeping the space cool. We actually woke up freezing a couple mornings which was quite surprising being it was 90-100 outside. We used the stovetop, oven, and microwave daily. The oven was very easy to use and maintained an accurate temperature so nothing burned. We baked a lot while here and had no issues at all. The stovetop worked well – all four burners. The laundry room was excellent. The dryer works on a time dial, which made tracking laundry times very easy to do. Everything was clean and dry after I finished. The house was perfect for us – a family of five. The house was great for sleeping and spending all day inside playing board games, cooking, and having a good time. Additionally, the house was extremely affordable and provided everything we needed for our two-week stay. Alex and his wife are very helpful and quick to reply. The neighbor downstairs stole our parking spot a few times and Alex was very responsive to everything. In general, we had an amazing time here and loved the house and all of its charm. We had a 4 night reservation, but left to go to a hotel after 1 night. We arrived very late, & as we were settling in, realized that the place was not nearly as nice as the pictures. The street was very busy, with cars zooming by noisily. A large chamois hung inside the gate by clothespins. The yard was scrubby with little grass, weeds, cheap sagging furniture & cobwebs. The metal screen door was dirty & covered with cobwebs. Inside, the hardwood floor was heavily stained (even had a footprint under the urethane). The kitchen had a previous leak, & stains ran down the wall. A warped, bulging cover over the water heater graced the corner. Windowsills were peeling. A bare bulb was in bathroom, with the fixture cover missing. The bedroom had a cheap carpet with a tired looking bed & the attempt to make the appartment look “vintage “, was a crooked mounted picture with the frame falling apart. The bedroom smoke detector was missing, with bare wires hanging down. Alex was responsive when I would text him asking about where to park (on the street in front of his garage doors). We debated whether to stay or leave, as we would have to find a hotel at the last minute. By the next evening, we couldn’t take it anymore, & called hotels. As we were leaving, there was a loud argument going on outside. A long term tenant was cursing out Alex, telling him he had lived there for 3 years & the place was full of weeds. Another tenant was laughing & filming the argument. We left as fast as possible. The place is cool. But kind of old and a bit tired. For me, it was perfect. I was alone. Overall, worth the money!